It is not every day that someone from a small town such as Tabernacle gets recognized by a multi-billion-dollar global magazine that is read by 23 million people each week. 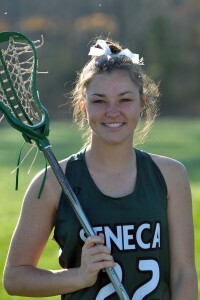 This may be why senior Seneca midfielder Madison Schulte thought her mom was pulling a fast one on her during her senior trip when she broke the news that she was selected to be Sports Illustrated’s High School Athlete of the Month. Sports Illustrated got wind of Schulte’s story early in the season, and she was put in the running with numerous high school athletes across the country to win this award. SI representatives came to Seneca for two days to conduct interviews with people close to Schulte and get some footage of her playing and coaching. Schulte’s passion for the game cannot be satisfied by the countless hours that go into playing a high school sport; she also coaches a U11 girls’ team on the side. While Schulte and her parents had a bit of natural nerves going into the interview with SI, the little girls had no problem grabbing the microphone. “All of the girls were so excited. They lined up after practice asking if they could all talk,” Schulte said. As for the high school team, they tried to keep the atmosphere very stern to make sure they came off as a group that was focused on nothing but winning games. It’s a task that can be tricky at times for a silly group that likes to keep it light at practice and focus on having as much fun as they can. You’ll never catch anyone getting down on a teammate with this team, even when they have a bad game. It’s constant positivity from every direction, and it seems to be working. After being awarded a three-seed in the playoff bracket due to the success it had in the regular season, the team is now cruising and is only two victories away from being crowned Group 3 champions. “It’s been so much fun. That’s really the only word I can use to describe it,” Schulte said. However, it has not always been fun for Schulte. After exploding onto the scene her freshman year, earning a spot on varsity and leading the team in scoring, she was getting serious attention from a number of big-time college programs. Having her early teenage years being dominated by visiting campuses and letters from college coaches overwhelmed her. She was being recruited, and she didn’t even know if she wanted to be recruited. “I felt like everything was happening too fast. I needed more time to think about things, I just needed a break,” Schulte said. Going into her sophomore year as an all-conference midfielder, Schulte abruptly decided to hang up her cleats and walk away from the game. Taking a step back really helped her find herself and be a lot happier. Nevertheless, some things were just not the same. Fellow senior Megan Drum and Schulte have been inseparable since they met on their third-grade lacrosse team. “It was very weird when spring came around and I would look to hang out with her after school and then I’d remember she had a game or practice,” Schulte said. Schulte’s coach Morgan Crothers made it an ongoing habit to jokingly ask her former superstar if she would be coming to tryouts. However, one day before the season this spring, Schulte gave her a different answer and decided she would be in fact attending tryouts. “It was just a perfect opportunity to get involved with people that I’ve been around for so long that I’m not going to be seeing much of next year as we all go off to different colleges,” Schulte said. Though she focused solely on bringing the fun back to the game she had played all of her life, it is human nature to occasionally wonder what could have been. Schulte will be attending Penn State in the fall. Though she is not sure if she will be playing on the team, she will definitely be staying involved with the sport, whether through intramurals, clubs or even coaching. After considering entering the business field, she quickly decided it wasn’t for her. High school and college sports can be very demanding with the number of hours it requires of its athletes.